Category Archives: Who Are The Victorious Group..?? 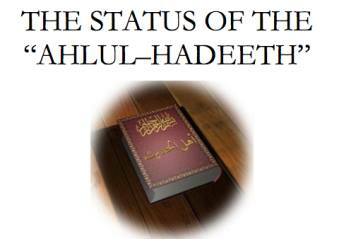 ” AHLUL HADEETH ” An Attributive Name & Consensus 50 Statements Concerning The Ahlul Hadeeth By SHAIKH ZUBAIR ALEE ZAI RAH. 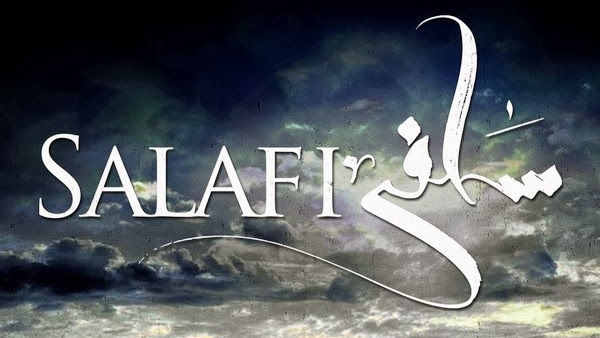 Alhamdulillah and glorified be He, Allaah Alone, the SalafieeScholars, Ahlus Sunnah and Ahlul Hadeeth wherever they maybe from,we love them, revere them and promote them as they are the inheritorsof the prophets from all the different lands. We love and revere thembecause they promote the divine teachings of the Quraan and Sunnahbased upon the manhaj of the Salaf us-Saaleh and this is the reason andthis reason alone why we love, revere and promote them. The treatise in hand by Shaikh Zubair Alee Za’ee Rah. is a compilationof the statements showing the position and status of the Ahlul Hadeethand all those who adhere to their way and a reprimand and reminderto those who oppose or those who abstain and dismiss their way. MayAllaah reward the Shaikh for his efforts and increase his reward. 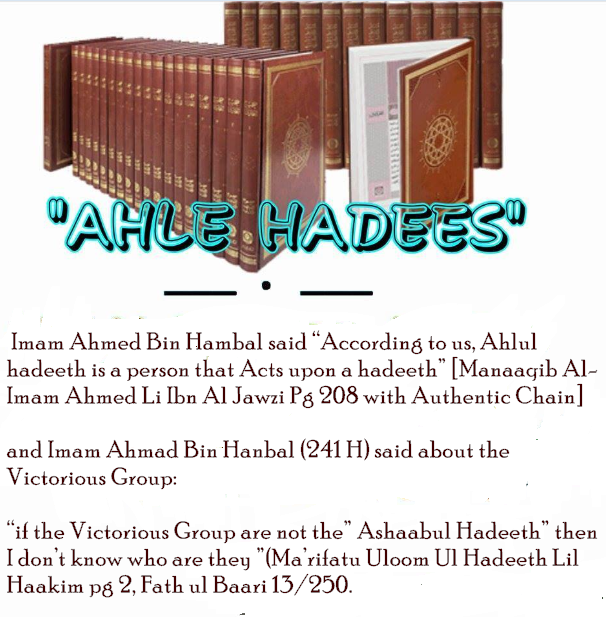 “if the Victorious Group are not the” Ashaabul Hadeeth” then I don’t know who are they ”(Ma’rifatu Uloom Ul Hadeeth Lil Haakim pg 2, Fath ul Baari 13/250. 2) Ameerul-Mumineen Fil Muhaddaseen Imam Bukhari in Al-Hujjah fee bayaan Al-Muhajja1/246 ,Imam Bin Hanbal in Fath ul Baari 13/250 and Imam Al-Madeeni in Sunan Tirmidhi H#2999 have stated thatthe Victorious Group OR Saved Sect is Ahlul hadeeth. 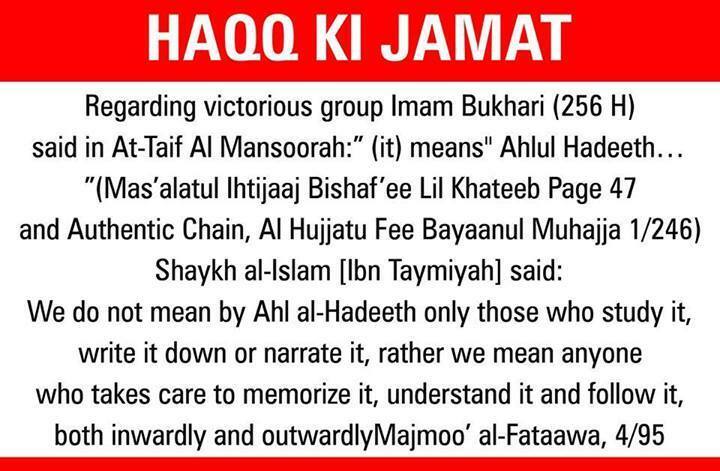 So if “Ahlul hadeeth” stands for Muhaddaseen ONLY then does this means only the muhadditheen will be going to Jannah and their general public will not go to Jannah???? Who Are The Victorious Group….??? Our Prophet (sallallaahu ’alayhi wa sallam) said, “There will cease to be a Group from my Ummah “victorious upon the truth,” not being harmed by those who oppose them until the command of Allaah comes about, and they are like that.”] Related by Muslim (6/52-53) and Aboo Daawood (2/202)……. Some Muta’asib Ahnaf of Indo-Pak claim that the Ahlul Hadith of their country are a new sect, having no precedent, are created by British, and many other lies…..
Now either these people are extremely ignorant or great liars who want to deceive laymen.